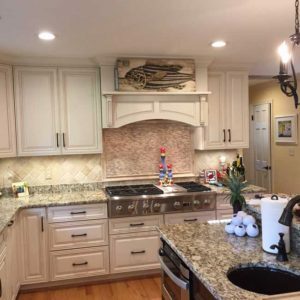 We are a specialty cabinet store offering cabinets from basic stock sizes, to semi-custom cabinets, and complete custom work. Our semi-custom cabinets can be ordered in face frame construction or full access European style. Our European construction cabinets can be ordered as an all wood cabinet with wood or laminate doors. Since we carry a wide selection of cabinets from stock sizes to semi-custom and custom, we are able to stay within your budget. For countertops, we offer granite, quartz, laminate, and wood. We are able to provide stainless steel sinks for our stone tops and we also have a wide selection of cabinet hardware.